Image: ballyscanlon/Getty Images. Design: Ashley Britton/SheKnows. Thanks to the new Netflix series Tidying Up with Marie Kondo, countless people are now considering clearing out the clutter in their homes and choosing joy through minimalism. And that’s a great place to start! But have you ever given any thought to truly embracing a life with less… stuff? If so, we’d be willing to wager tiny living has come up as a topic of conversation in your household at some point. For many families, though, the thought of tiny living with kids can feel daunting. Won’t they go crazy without their toys? Will they kill each other in such a small space? Is it even doable? The logistical questions never seem to end. Trust me, I know — a little over a year ago, I was asking myself those very same questions. After doing my due diligence, I did ultimately sell my home to pursue a tiny lifestyle with my husband, two kids and two dogs. It’s been one of the most liberating decisions I’ve ever made. But even a year in, I don’t pretend to have all the answers. 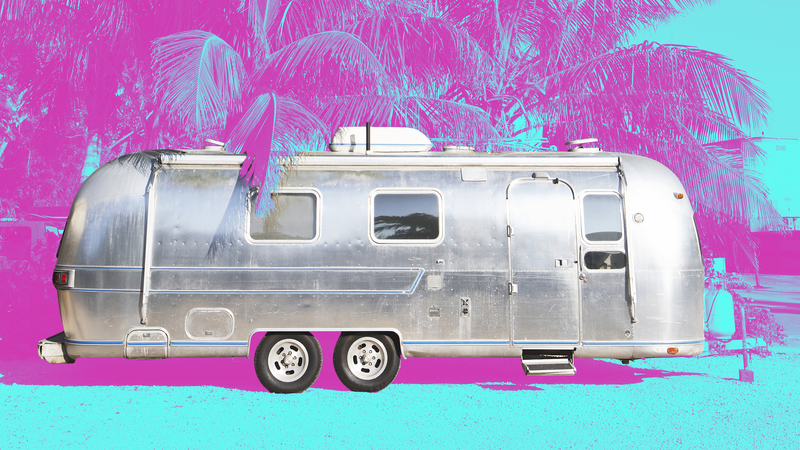 Instead, I polled my tiny-living community (families living in RVs, in tiny homes on boats and even out of hotels) to find out their best tips for tiny living with kids. “We have five kids and have lived in hotels, a tent and an RV. While it has its challenges, traveling full-time and living in a small space has been the best accident to happen to us. Traveling full-time has given my children an education unlike anything they would receive in a traditional school or even homeschooling in a traditional setting. They have become healthier and more cultured. They have gleaned the ability to interact and form friendships with people from all sorts of backgrounds and walks of life. “My children also spend less time dependent on a screen for entertainment. We have never spent as much time outdoors — hiking, wading through creeks and learning about plants and wildlife — as we do now. It’s one thing to read about alligators; it’s something completely different to be held in your daddy’s arms 30 feet from one in the Everglades. We won’t forget the first time we saw a sea turtle swimming not 5 feet from us. Or hiking through the desert to see Petroglyphs from their ancestors carved 700 years ago. “Get lots of kids’ tennis shoes, because you’re going to want to play outside all of the time.” — Mandi S.
“Limit your pets and their size. Less is so much more — space for your humans is paramount.” — Lori B. “We have three teens. There have been a few things that we had to figure out when we first started. They are most helpful to us, and when we haven’t been diligent to do them, we have noticed a difference in their overall happiness and enthusiasm to keep traveling full-time. “Skype for keeping in touch with friends back home. “Get outside! Staying inside is the killer of life. You don’t realize that it is affecting you right away, but over time, it takes a toll, and you feel like poop and don’t know why. So we make it a goal to get sunshine, fresh air and exercise every single day. If we have rainy days, we get in the truck and take a drive to check out the local scenery. “If you have relationship or obedience problems, they get worse. The cracks start to show quickly, even if you go into it with a pretty good dynamic. We went in with very obedient kids, but found that they had been avoiding one another’s annoying habits instead of dealing with the work of talking it out. So they were on each other’s nerves some when we first started out. Now, we deal with our stuff right away. Everyone takes responsibility for their behavior, and nobody is allowed to make excuses for bad/annoying/rude/thoughtless stuff. The kids have come a long way in the past two-and-a-half years, and we can see the improvement in their individual relationships from figuring out how to live with others in mind. “Let them pick some of the outings. They get pumped when we go somewhere they wanted, or eat some weird thing they’ve heard about. So I always try to listen to the things they mention and then include them. “We’ve been tiny-living for almost a year, and the greatest thing I’ve learned — and advice I can give — is that toys don’t matter. My children are 6 and 10, and outside is the best place to be.” — Heidi M.
“My husband and I have a 20-month-old toddler and a baby on the way, and we’ve been tiny-living since Dec. 27, 2018. So far, the best things we’ve found for making it work are having a routine and getting outside. “Whether it’s exploring nearby parks and play areas or visiting indoor entertainment centers, the key is to stay busy and not feel confined by the space. Home still needs to feel like home and can’t become a burden because space is limited. I’ve become 100 times more involved with my child because, frankly, there’s no more ‘escaping.’ I have to give her my full attention. “I’ve also realized that you cannot do this lifestyle without a little patience and the ability to accept the uncomfortable. You must become comfortable being uncomfortable — and find the joy in doing so.” — Marisa G.
“We’ve been living tiny with our now-6-year-old son and 7-year-old daughter for just over a year, and I feel like we’ve learned loads! For starters, kids really don’t need nearly as much as you think they do. When we had our 2,000-plus-square-foot home, it was stuffed to the brim with toys and electronics. Our kids still have select toys and games now, but they never notice what a tiny percentage it is compared to what it once was. “A second piece of advice would be to embrace the advantages. We’re investing a chunk of the money we’re saving by not having a mortgage into various funds and savings accounts. And the rest of our extra income we spend on having fun. Movies, theme parks, restaurants, tourist attractions — a primary reason we went tiny was so we could collect experiences, not things. This lifestyle allows us to do that and remain 100 percent debt-free in the process.” — Julie S. (aka me! ), Wild Marrow & Co.
“When we first bought our tiny home, our friends and family thought we were crazy! We have three young kids, and no one could understand how we were going to make it work. But it’s been two years, and our little family is thriving. Now, some of those same skeptical friends and family are considering doing the same thing. “So anytime someone asks for advice, we tell them the same: Trust your gut as a parent. You know what’s best for your babies. And use the opportunity to teach your kids why minimalism is such a great thing and how it is practiced in other parts of the world. If you teach them young not to be addicted to things, they’ll grow up appreciating the things they have more.” — Marie S.